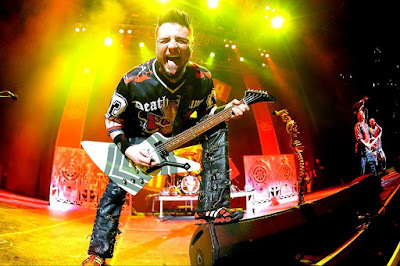 Jason Hook spoke to HMV.com about the band's Canadian tour for which the routing was determined by fan vote. About how the initial on-demand idea came from, he said: "We were all sitting around with the agents and managers trying to figure out how to route a tour. To some degree, it's just guesswork knowing which cities will be most receptive to your show. At some point, it occurred to us to ask the public where they'd want us to play, therefore eliminating the guesswork. So we set up an online voting poll and started analyzing data. And in some cases there was demand in cities we might not have played otherwise. Pretty simple stuff, but highly effective, so it made sense to repeat the process for Canada — 13 shows from coast to coast from B.C. to Nova Scotia." He added: "If there was a swell of votes for a certain area and then tickets didn't sell, there, we always had the option to either move the show or further promote it. It did feel there was a safety net there. And look, the public is cool. I don't think they want to confuse us or play games. They just want their favorite band to come to their city, which is ultimately a lot less work for them. Plus, this inspired confidence in promoters. And if the tour does well, we can come back sooner. So it's in everyone's interest to make this work."